When you walk through the front door of Table X, you realize you are about to experience something unique. Two years in the making, this collaboration from chefs Mike Blocher, Nick Fahs and David Barboza, is clearly a collection of great minds, artistic talents and hard work. The result is a beautifully crafted space with beautifully crafted foods. The large, open dining room is very inviting while the oversized booths welcome you in and encourage you to linger awhile. Although only the ceiling is an original feature left from the 1930s building, you definitely feel a prideful mannerism in the chefs’ poise as they speak about the history in those walls. Although they pride themselves on serving honest food without all the fuss, they have not neglected even one detail. From the interiors of the space to the clay plates the food is served on, you will feel like you are in a fine dining establishment–especially after you take your first bite. The kitchen is wide open so you feel part of the process and since each menu item is made to order, and from scratch, peering into the kitchen reassures you that your dish is being prepared with care. 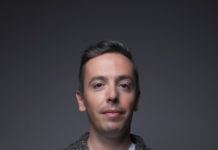 All three chefs contribute something unique to Table X, from their culinary experiences and backgrounds, to their heritages. We as patrons, get the pleasure of experiencing what each has to share collectively, in a exceptional food experience. The nightly menu is carefully crafted to compliment the tastes of the season and they have utilized open space behind the restaurant to grow lettuce, herbs, beets and much more–with the dishes evolving depending on what’s on hand. In addition, they purchase an entire animal, such as the Berkshire pigs, and use it in recipes until it is gone. That said, one night your favorite dish may be on the menu, and on the next visit, it may not. 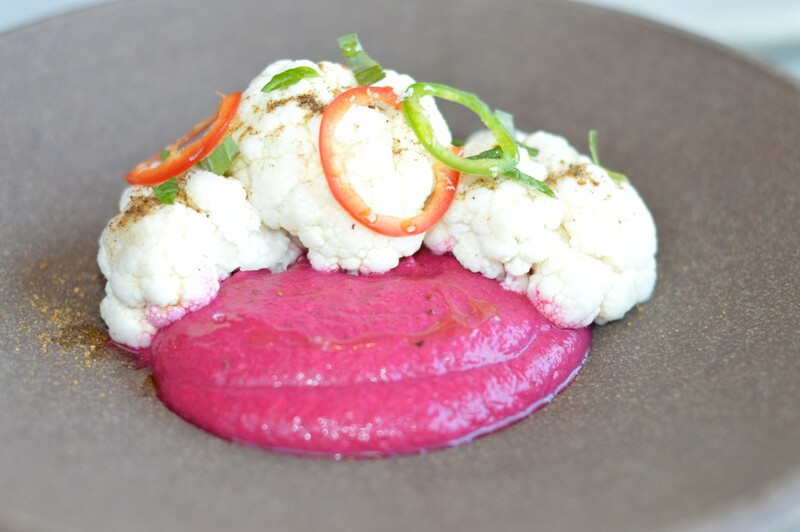 The red beet curry with brined cauliflower ($8) is the most beautiful shade of pink and has just a hint of curry flavor, enough to know it’s there. And, lets talk about the kimchi egg ($10), because if you try it, you will want to talk about it. The perfectly poached egg is nestled on a bed of house made kimchi, then topped with crispy pork bits. 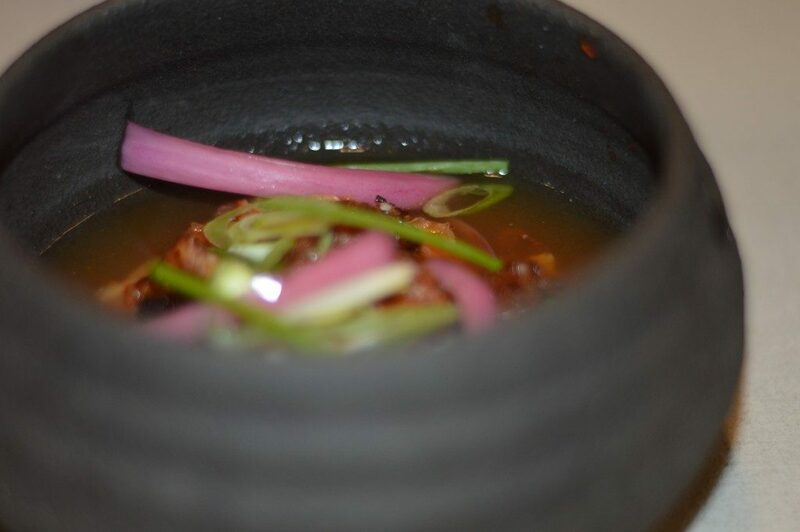 A warm pork broth is then poured over the top at the table, turning into a soup of sorts. It is rich and spicy, with a hint of salt from the pork. 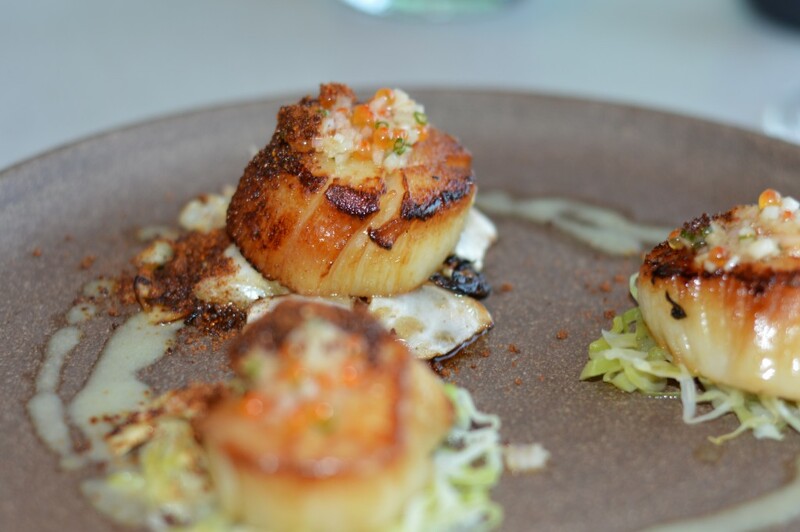 The diver scallops ($25) are seared and placed on green cabbage and sprinkled with ‘vegetable dirt’, a dusting created from vegetables grown on site. A tasty and unexpected addition to an already delicious dish. The Christiansen Farm Berkshire ork ($32) is pressed and presented in the shape of a square. Interesting presentation and full of flavor. 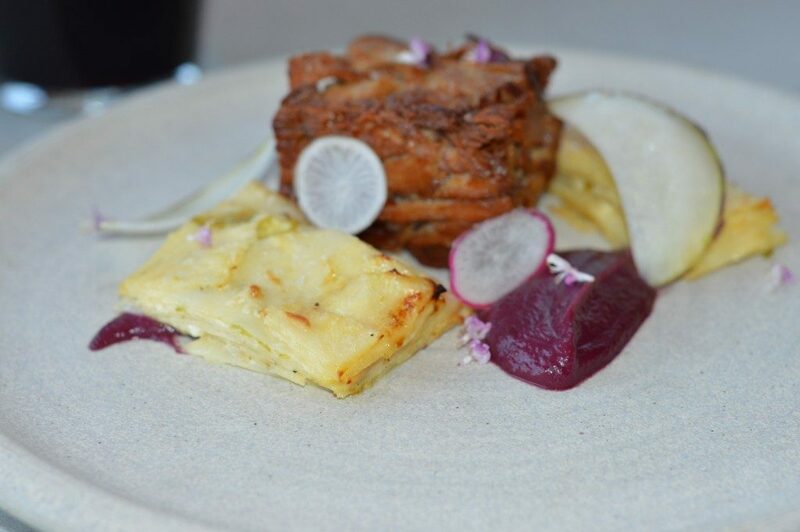 The pork is accompanied with red cabbage and turnip pave, creating a combination of flavors that are very pleasing to the palate.